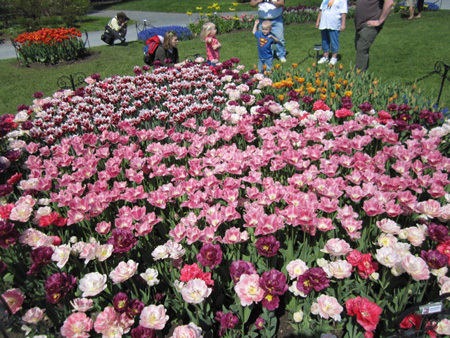 Saturday morning I checked out the tulips in Washington Park on the day of the Albany Tulip Festival. My goodness gracious they were the best I’ve ever seen them. Unfortunately I didn’t have my camera with me so I went back sunday morning to take pictures. 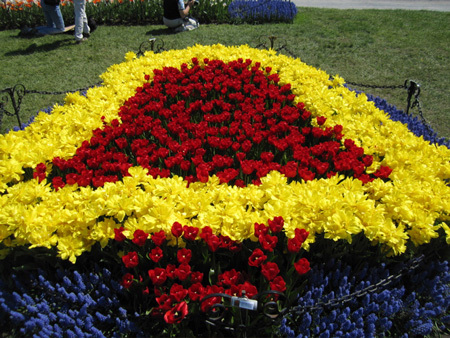 The tulips were no longer perfect but they were still pretty good. 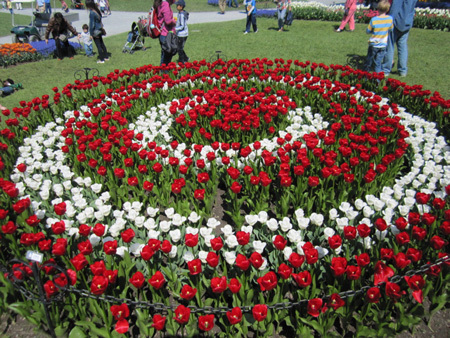 Anyway, I have yet to see any pictures by anyone that sufficiently capture the the absolute delightfulness of this annual horticultural display. Not that people don’t try to take The Perfect Picture. Every family group walking around admiring the flowers has at least one camera, ranging from phones to serious equipment and everything in between. And every family with small children must squat and smile in front of the flowers while usually the alpha male carefully composes the shot for posterity. Who caused this damage to these healthy tulips (in the photo above?) Gangbangers from Colonie? Irresponsible vandals from Clifton Park? Well, sort of. This was caused by a succession of families with young children posing for Dad’s camera, so busy posing that they gave no thought to the pretty backdrop they were crushing. Today (Sunday) no one wants to pose here anymore. 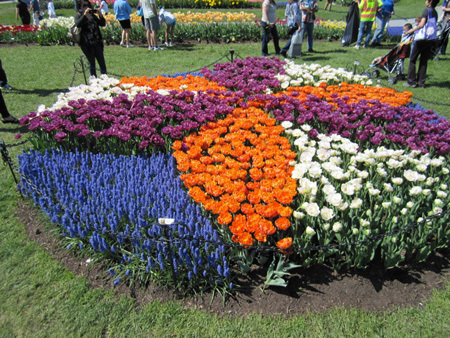 The designs made out of flowers were very precisely planted with great care. There was a whole set of what I would call medallions with very clean designs. It’s a shame I couldn’t seem to point my camera straight that morning, I keep cutting off the edges of the medallions. But you get the idea from the pictures. Not all of the medallions were round. I guess this one (above) is probably the Liberty Bell, that symbol of our great liberal traditions upon which our nation lives or dies. 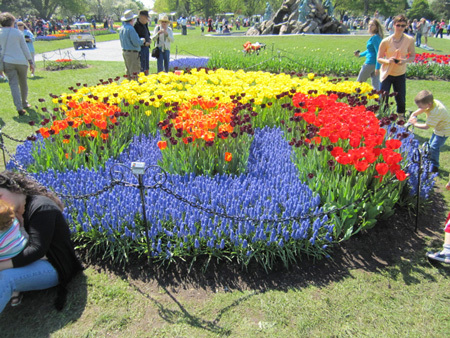 Some of the medallions were composed entirely of tulips, like in the photo above. 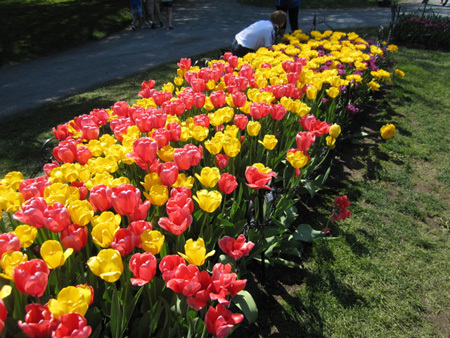 Don’t ask me what are the names of the tulip varieties because I don’t give a rat’s patootie. 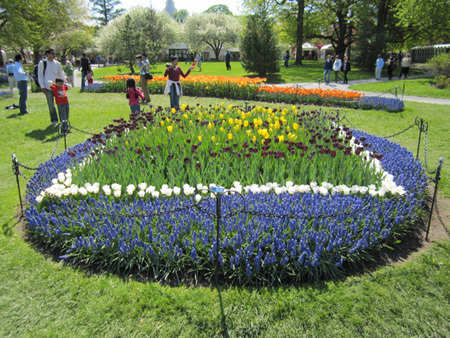 But there were other species of flowers that work well with the tulips. The gardeners like these purple flowers that resemble blue lupine from the Pine Bush, which is ironic because Washington Park was once Pine Bush covered with blue lupine and swarming with clouds of karner blue butterflies. I thought the little signs poked into the soil next to the flowers called these purple flowers muscaria. But I must be mistaken because muscaria is a mushroom, the kind that poisons you a little bit. 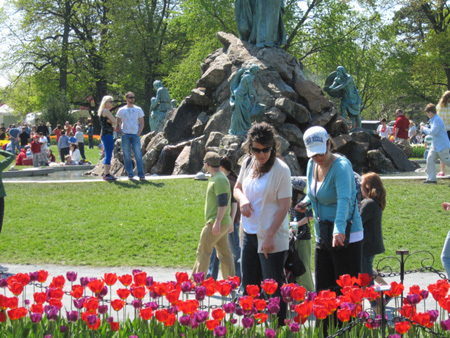 The Tulip Festival is a cleaned up version of the dark and lowborn Pinxter Festival, which was sort of social outlet for the black slaves that dates back to the Dutch occupation of the Hudson Valley. Pinxter was an alternate name for Whitsuntide or the Day of the Ascension. This marks the day in early May when Jesus of Nazareth is said to have ascended to heaven. But pinxter (or pinkster) is also a kind of pink azalea which blooms all at once at whitsuntide throughout the northeast US, Back in the day it covered open fields and hilltops on the edge of town. Like all azaleas it’s poisonous, but only in large quantities. I have heard that the slaves celebrating Whitsuntide would add the leaves of the pinxter plant to their celebratory hootch to give it extra kick. If that is true, then surely the slaves looked at the blooming of the pinxter flowers with joy and anticipation. In the week preceding Pinkster there was a gradual buildup to the festival "during which, the negroes patrol the streets in the evening more than usual, and begin to practice a little upon the Guinea drum." The slaves also set up an encampment on Pinkster Hill which was to become the "theater of action [emphasis in original]." A series of arbors were constructed by setting stakes in the ground and then weaving through them branches rom a shrub growing on the adjoining plain to create a series of "airy cottages" that were "impervious to solar rays." These shelters, arranged to form an amphitheater in front of the royal arbor, were filled with fruit, cakes, beer, and liquor. For the next three or four days and nights a variety of sports and activities occurred. The most important of these, indeed the apparent highlight of the festival, was Toto, or the Guinea dance. This took place in the amphitheater in front of the royal arbor. There sat the "chief musician dressed in a horrid manner -- rolling his eyes and tossing his head with an air of savage wildness; grunting and mumbling out certain inarticulate but hideous sounds" as he beat upon a Guinea drum. On either side of this character were two imps, "decorated with feathers and cow tails," performing similar "uncouth and terrifying grimaces" while playing on smaller drums and initiating "his sounds of frightful dissonance." Goodness gracious, doesn’t that sound like fun? It sounds to me like some of the West African traditions of the slaves survived into the 1800s. I wonder if back in the 1700s or in the 1600s the Pinxter Festival was extremely African, perhaps even a clandestine religious ceremony from the old country. Perhaps this time of year was more than an excuse to party, perhaps the story of the Ascension coincided with outlawed pagan ideas imported from Africa. 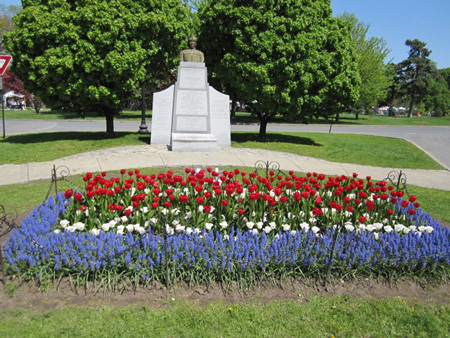 As I left the park I passed by the monument to Henry Johnson, a true hero by any patriotic standard. He was also a victim of outrageous blatant racism. 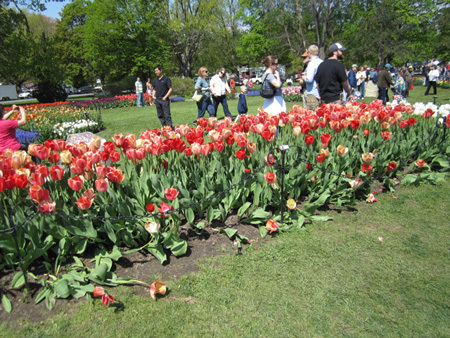 I was glad to see a plot of tulips planted before him in his honor. 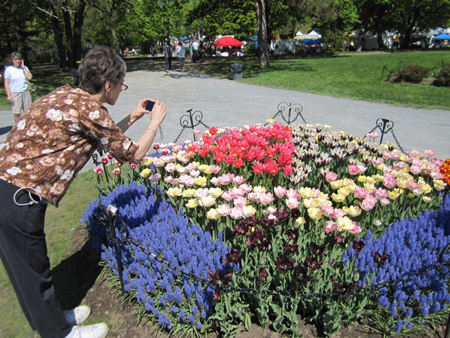 Then I noticed a family of foreigners alternately gazing at the monument and snapping pictures of the flowers. so I snuck up behind Henry and snapped their picture before going home. 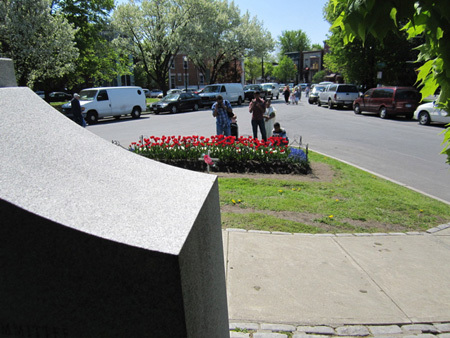 It’s good to see people care about such things, that’s what monuments are for. Lovely designs.. 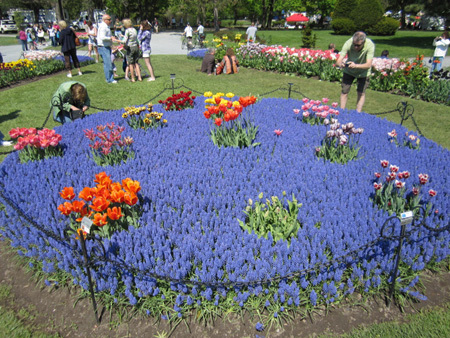 The common name for the Purple Flower "Muscaria" is "Grape Hyacinth"
Thank you Deanna! One of the photos in this article was used by Deanna in an article about upcoming festivals in Albany that she wrote for the SUNY Polytechnic Institute, which is located near Utica NY. Check out the link in her comment above.